February 2018: HFEA grants first patient licence for mitochondrial donation to Wellcome Centre for Mitochondrial Research in Newcastle. UK becomes the first country to legally offer the procedure to a patient. The Lily Foundation are delighted to have been instrumental in the recent change in UK law to allow the use of a new IVF technique known as 'Mitochondrial Donation' or 'Mitochondrial Replacement Therapy'. This technique aims to stop the transmission of some types of Mitochondrial Disease from mother to child. The resulting baby would have all the genetic traits of the mother and father but would also have healthy mitochondria from a donor woman so would be free from disease. It could be thought of like replacing the batteries in a toy - the toy remains exactly the same, it just has the power to work properly. 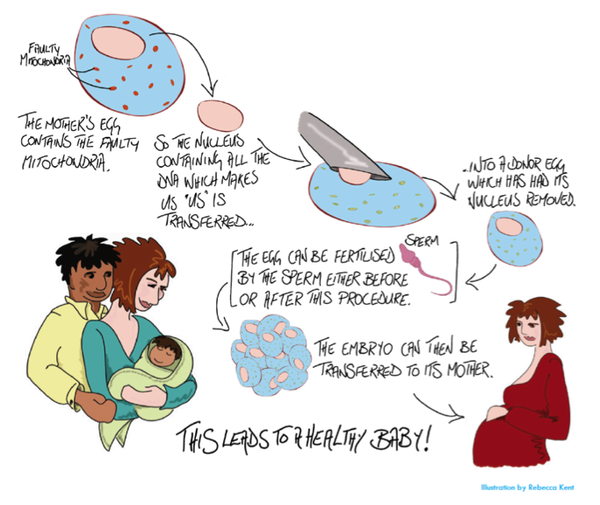 The technique involves replacing the unhealthy mitochondria in a woman who carries the disease, with the healthy mitochondria from a donor woman during IVF. Nuclear DNA which is involved in determining all your traits and characteristics is simply transferred from one egg to another but remains completely intact and unchanged during the technique. The resulting baby has 100% nuclear DNA from its Mum and Dad (and all their characteristics) but with healthy mitochondria from a donor to give it energy to grow and function normally. If a woman is well enough to have a baby, how can she pass on Mitochondrial Disease? A mother may carry a faulty mitochondrial gene at a low level so that she herself may only have mild symptoms (if any), however she will pass this faulty gene to all her children in varying proportions from 1% to 100%. The degree to which an unborn child might be affected is incredibly difficult to predict. A severely affected infant may die in the first few weeks of life and any child born with a proportion of faulty mitochondria is likely to experience some symptoms which may come on at any stage of life. Both techniques have been tested in animals and resulted in many generations of healthy offspring. Successful results have also been seen in human cells in the laboratory, however until the 4th March 2015 legal restrictions meant these treated embryos could not been implanted to form a pregnancy. Based on animal models doctors have no reason to believe human pregnancy will not result in a healthy child. Would the new baby have DNA from 3 people? The baby would have <0.1% of their total DNA from a 3rd person and this would be mitochondrial DNA (mtDNA) in the donated mitochondria which enables normal energy production. The overwhelming majority of the DNA 99.9% (all the nuclear DNA that determines human characteristics) would only come from their mother and father. Will this open the floodgates for ‘designer babies’? No. This will not be possible. Human characteristics and traits are controlled by nuclear DNA and this technique does not modify nuclear DNA at all. The resulting child will have 100% of its parents nuclear DNA and therefore will be the same unique blend of their characteristics as they would have been in a normal pregnancy. The ban on altering nuclear DNA will remain in place and there is no intention to change this. Is Mitochondrial Donation a germ-line therapy? As these techniques involve changes to a person’s mitochondria they will be passed down from mother to child through the mitochondrial DNA to the next generation. If the child is female, that same change will be passed to their child and so on. As a result these techniques are considered a form of germ-line therapy. However, we believe this is one of the great benefits of this technique as it means that future generations will be born free of Mitochondrial Disease. Does this technique work for all Mitochondrial Diseases? No, this technique will only work for families whose Mitochondrial Disease is passed down from mother to child (also called maternally inherited). This happens when the error lies in the mitochondrial DNA - known as mitochondrial DNA disease (mtDNA disease). Mitochondrial Disease can also be caused by changes to nuclear DNA. As this treatment does not alter the nuclear DNA at all, it cannot help families with this kind of Mitochondrial Disease. The Human Fertilisation and Embryology Act passed in 2008, allowing researchers to develop techniques to prevent transmission of maternally inherited Mitochondrial Disease. On the 3rd February 2015 the regulations were debated in the House of Commons and MPs given a free vote. Overwhelming cross party support resulted in a vote of 382 Ayes and 128 Noes. On the 24th February 2015 members of the Lords discussed the details of the regulations. A motion attempting to block their approval, went to a vote with 48 for and 280 against, so the draft regulations were agreed. On 29 October 2015, the HEFA published the licencing conditions for Mitochondrial Donation and these regulations came into force. The HFEA is now authorised to license and regulate Mitochondrial Donation. Mitochondrial Donation in the UK is now a reality. It can be taken out of the laboratory and offered to families that can benefit. Specialist centres will be allowed to apply to the HFEA for licenses on a case by case basis to offer this technique to severely affected families as a reproductive choice. On 9th June 2016 the results of a study using the ‘pronuclear transfer’ technique in human embryos to prevent the transmission of mitochondrial DNA disorders was published in the journal Nature. The study was carried out by researchers at the Wellcome Trust Centre for Mitochondrial Disease at Newcastle University, and involved over 500 eggs from 64 donor women. Results of the study suggest that the technique will lead to normal pregnancies whilst also reducing the risk of babies having mitochondrial disease. The results of the study will now be considered by the Human Fertilisation and Embryology Authority (HFEA), who will decide whether to issue the first licence to a clinic for the technique to be used in treatment. On 30th November 2016 the HFEA expert scientific panel agreed that there was sufficient evidence on mitochondrial donation to take the next step and proceed cautiously with offering this to families at high risk of passing mitochondrial disease onto their child. This was subject to final HFEA approval in December 2016. On 15th December 2016, the HFEA gave their final approval to mitochondrial donation. Clinics can now apply for licences on a case by case basis to treat families at high risk of passing on mitochondrial disease. NHS England will fund the first treatment trial for women who meet the HFEA criteria, so long as they agree to long term follow up of children after they are born. On 16th March 2017 Newcastle-upon-tyne NHS Foundation Trust & Newcastle University were the first site worldwide to be approved by the HFEA as an authorised site to undertake mitochondrial donation. In March 2017 the first treatment application for Mitochondrial Donation was submitted to the HFEA for approval. In April 2017 a new 'reproduce choices service' was set up in Newcastle to look after families with mitochondrial disease wishing to explore mitochondrial donation and other reproductive options. If you carry maternally inherited mitochondrial DNA disease and you are looking at extending your family, there are a number of reproductive choices available that might be suitable for you. For further information on these options please contact your own clinician. If you are eligible for Mitochondrial Donation and wish to be considered for this treatment, please direct your enquiries to The Wellcome Trust Centre for Mitochondrial Disease c/o Doug Turnbull [email protected] who will review each enquiry on a case by case basis.